hannon Lee explains how she's made it from 'famous daughter' to 'hot Hongkong star'. By Ti Lian-Lin. When Chinese movie stars Jackie Chan and Jet Li dropped Hong Kong for Hollywood last year, film critics on both sides of the globe got off their bums and clapped for more. Finally, the long-awaited fusion of US filmmaking and formidable Oriental skills. Never mind that you had to strain your ears to catch snippets of mispronounced dialogue; the house was already screaming at every high-octane punch and quickie roundhouse kick. So imagine the incredulous silence that followed a few months later, when the exact phenomenon happened again, but in total reverse. An American called Shannon Lee packs her bags and abandons the country in favour of a starring role in a Cantonese martial arts movie, made in Hong Kong with the usual wire-hanging escapades. 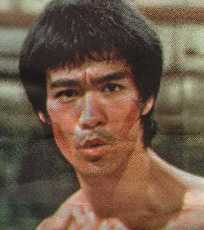 Many of you have heard of Shannon, 29, even if it's only because of her father, the legendary dragon fighter Bruce Lee. What many of you may not have known is that Shannon is now a big movie star in the East, thanks to 1998's violently acrobatic kungfu film Enter The Eagles. She even gets the chance to trade blows with Benny The Jet, a star in his own right. "The filmmakers brought him in to play the bad guy," Shannon explains. "And I was really glad, because Benny's got a huge reputation. He's done films with Jackie Chan before and he knows the ropes." "Of course, in the movie I get to beat him up!" Only a tot when her famous father died, Shannon resists the kind of celebrity sensation Bruce Lee evoked in his films, and his reactive philosophy of Jeet Kune Do, but she's been hapless in avoiding either. Tongues have begun wagging with her bruising debut as Mandy, ex-Interpol agent recruited for a diamond heist in Enter The Eagles. This movie, named after the infamous Enter The Dragons (1973), was intended by an overzealous Hong Kong director to capitalise on the hoopla surrounding the 25th anniversary of Bruce Lee's death. Although it's paralysed by a bilingual script, the movie has been a box-office sensation because it relies mostly on Shannon Lee's draw. Shot intermittently in Prague and Hongkong, the film tracks the convoluted flee and capture of an Eastern Europe profiteer, and was directed by the bratty but brilliant Corey Yuen, who revels in the orgies of gunplay and hand-combat. The film rides a tough road and, inevitably, leads to an arresting showdown in a Zeppelin. Shannon's on-screen strength and agility has led scores of Asian film critics to call her a "powerhouse". While Shannon talks about her determination to play the part of Mandy, she reveals that the role in the Hongkong film made her want to shrivel up. "I was nervous because I had never done anything so un-American before." This is Shannon speaking over drinks while ensconced in a huge melon-coloured sofa in her private hotel room, a relief from the Kuala Lumpur heat outside. She's in Malaysia as part of an extensive Asian promo tour. She adds: "I had to undergo a long training process to prepare for this film, because everyone wanted it excessively action-packed, like one of my father's films. Not just martial arts, but running in a volley of bullets and rolling over cars - all that sort of things. It was a terrible adjustment, physically. People forget that I am not him." Outwardly, Shannon is unconventionally girlish. Medium and trim, with a mane of lightly greased hair secured into a bun by a slim dazzle-pin, making her more sophisticated than normal, she dresses with the same dotted-line economy (crisp white shirt, understated long grey skirt) that she uses when choosing her words. Her conversation swings from the whimsy hopefulness of a late starter, to the guilty expressions of a transient half Chinese-American who is desperately seeking her roots. At 29, Shannon is uncertain of where her career belongs. In Asia, she announces, people aren't taking her seriously but for her name. In the States, the only roles she gets to play are in kooky Oriental plots with heaps of misguided cultural pointers. "Naturally, I couldn't get away from making action movies, as the whole magic of being half-Chinese is that America assumes you have a natural flair for fighting," she says, unleashing a whoop of derision. "People think I've inherited my father's versatility in action films, so learning to reconcile my life to that far-flung sentiment has been a long and gradual process."